School Buses Now Take Wireless Internet For A Ride The Vail School District in southern Arizona last year installed a wireless router above the front windshield in buses for students who have long commutes. After hearing about the program, about 25 U.S. school districts have also signed up for the service. But one concern for administrators is making sure every student has a laptop. 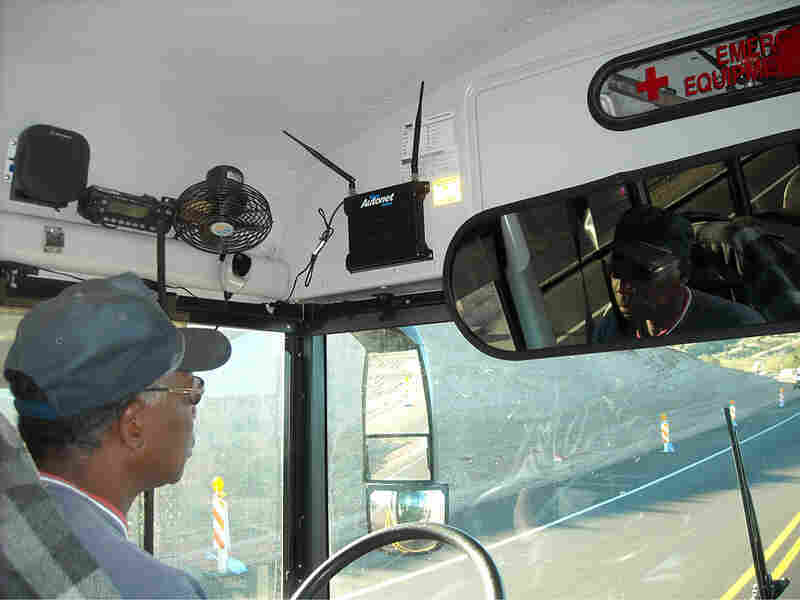 Bus driver J.J. Johnson says high school students in southern Arizona are benefiting from wireless Internet on the bus. With less idle time on the hourlong commute, he says, they're not fighting as much or making nearly as many spit wads as they used to. Each school day, bus driver J.J. Johnson picks up his high school passengers outside a local fairground in southern Arizona. Thus begins the unique journey to Empire High School. The bus ride sweeps through the sparse high desert near Sonoita, a short drive from the U.S.-Mexico border. The Vail School District covers more than 400 square miles, and these students can easily spend more than 2 1/2 hours on a school bus every day. But since November, the high school students aboard the buses have enjoyed a distraction, or a study aid, depending on the moment: access to wireless Internet. On a recent morning, freshman Jerod Reyes finished his Spanish homework and played a video game on the Internet. He says getting a Web connection on the bus is really cool. "Let's say you have a world history project you need to get done. If you have to do research or get pictures for a PowerPoint you're making, just go on the Internet and get it instead of having to wait until you get to school." To pull this off, the district installed a wireless router just above the front windshield. The little black box creates an instant Internet hotspot, according to the Vail School District's head of technology, Matt Federoff. The box is constantly searching for cell phone towers as it rolls down the highway. The signal briefly fades in one mountain pass. "It's amazing to me -- who remembers the Internet coming over the modem -- that we now can provide a faster Internet experience to 40-plus kids in a moving vehicle," he says. "That's magic." Sterling Pratz, the CEO of Autonet, the company that makes the routers, says the devices had been primarily for private vehicles. School bus connectivity wasn't even on his radar a few months ago, he says. "People went from connecting their homes to connecting their handsets. And now they're moving into the next evolution of connecting things. And vehicles are the next logical step," he says. After hearing about Vail's program, Pratz says about 25 U.S. school districts, both rural and urban, have signed up for the service. Autonet has now adapted the service for schools. Its filters prevent kids from accessing adult content. Julie Hudson of Vanderbilt University says she's surprised the Internet-bus concept didn't catch on sooner, because wiring buses is not expensive or technically challenging. But not every family can afford a laptop, and that's a "tougher nut to crack," she says. With Vanderbilt's support, Hudson leads a three-year-old program in rural Arkansas called Aspirnaut. It has connected three school buses to the Internet for about $1,000 each. That program also gives laptops to its students. Hudson says she's optimistic that eventually laptops will become widespread in the public school system. That's the way it works for the kids at Empire High School in Arizona. Empire doesn't use textbooks, and it offers every student a laptop for their studies. But it's probably useless to ask kids to use the Internet exclusively for schoolwork, especially on a bus. Administrators say they don't mind a little distraction as long as it's clean. As for academics, they say they're not sure if the Wi-Fi bus has had any impact on grades. But driver J.J. Johnson says students like it. And with less idle time, he says, they're not fighting as much or making nearly as many spit wads. "They get to school happy, healthy and ready to learn," Johnson says. Johnson's passengers file out, and another 100-mile commute on the Internet school bus is complete. The district likes the program so much that it's raising money to equip its entire fleet of high school buses.